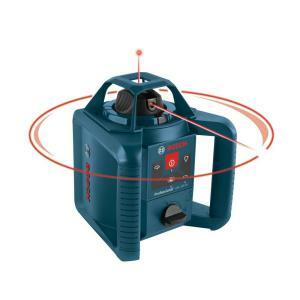 The Bosch GRL 245 HCK rotary laser offers horizontal/vertical self-leveling to reach level, aligned and square. Maximum 1/8 in. accuracy at 800 ft. High rotation speed, manual angle adjustment gives this rotary laser versatility with maximum visibility. Electronic self-leveling up to +/- 5° and functionality that stops laser when out-of-level condition exists. Dual-sided laser receiver allows 1-person to run the laser. Tbook.com crawls the web to find the best prices and availability on Levels and related Tools and Hardware products like Bosch 800 ft. Self-Leveling Rotary Laser Level Kit (5-Piece). For this page, related items include products we find that match the following keywords: "Level" at our vendor partner Home Depot. Bosch 800 ft. Self-Leveling Rotary Laser Level Kit (5-Piece) is one of 154 Levels and related products listed in the Tools and Hardware section of Tbook.com If you have any questions on this product, please give us a call at 734-971-1210 during the hours of 9am - 5pm EST for assistance. Thank you for shopping at Tbook.com, the Internet Department Store!